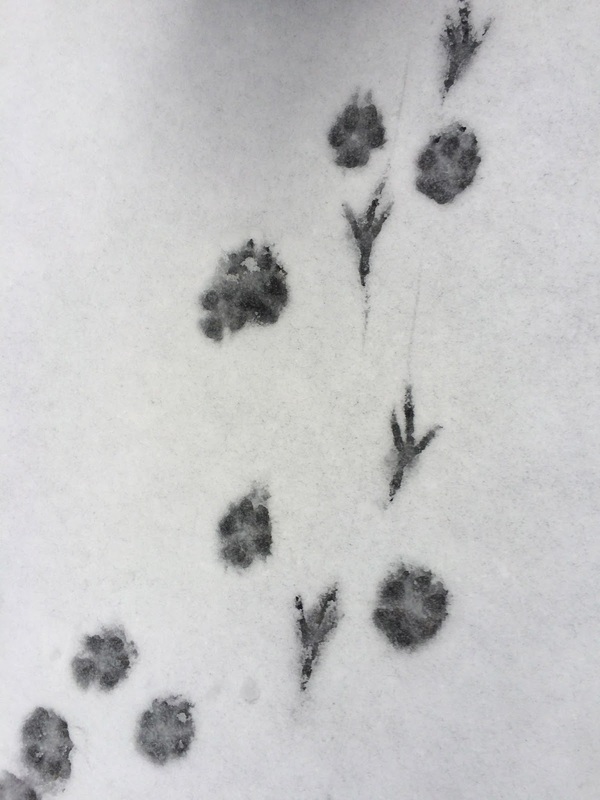 Based on very little I am guessing these are Varied Thrush tracks. We found a spot where they intersected bunny squirrel tracks. 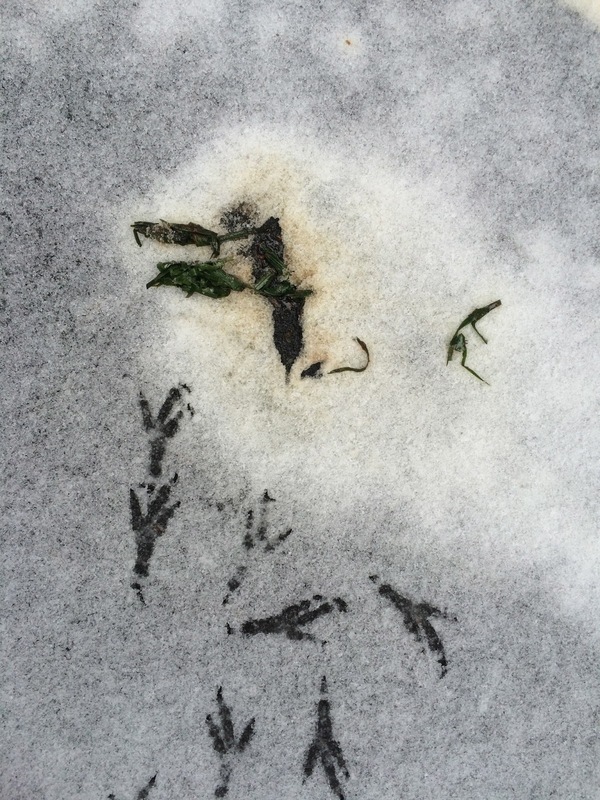 Later on some bigger bird tracks had me hoping for grouse, but then I took a look at the behavior of the bird. The bird flew in and landed on the left, then it walked over to some dog/coyote poop. It looks like it even pulled apart the poop to check for snacks. None of this added up for grouse behavior, but sure sounds like a raven. Above are Ralph's tracks next to another set of large tracks we found, that may also be raven. The point of going to up to Larch Mountain was to retrieve my camera trap, which I had left for two weeks a few miles up the road. I caught more hikers than I was anticipating, even some hiking at night. I also caught a pair of coyotes. Pausing to see what his partner is doing. This next sequence had me going for a second until I realized there were some people with their dog in the top left. So this has to be a dog. Right? 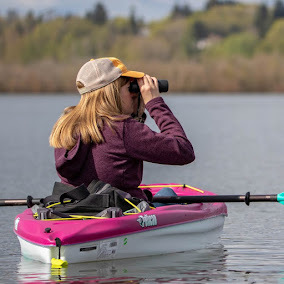 Speaking of camera traps, if you haven't yet seen this OPB article on Horned Larks in St. Johns you should check it out. My head is full of ideas. Anyway. On yesterday morning's dog walk to Mays Lake I found a crow dining on a baby cottontail. Once he got his fill he flew over to a second crow and actually fed her/him a bit. Then that crow strutted over and started digging in. My first dead towhee. I almost took it home. I think that's all I have for you today. More live birds next time, I promise. Good times! Great shot of your buddy in the snow...The tracks are really cool!! Thanks! I forget how excited Ralph gets in snow and I feel bad he only gets to see it once a year or so. Now I just need a giant magnifying glass and a tweed trench coat. Hi Jen. 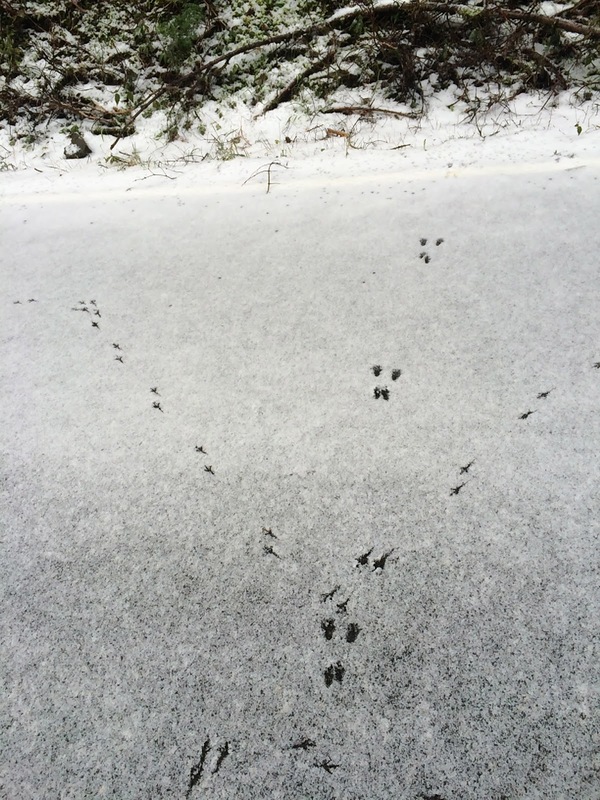 The "bunny" tracks in snow on Larch Mtn are actually squirrel tracks - you can tell by the placement of the front feet (the smaller ones behind the hind feet) being side-by-side. Rabbits and hares place their front feet off-set by several inches. 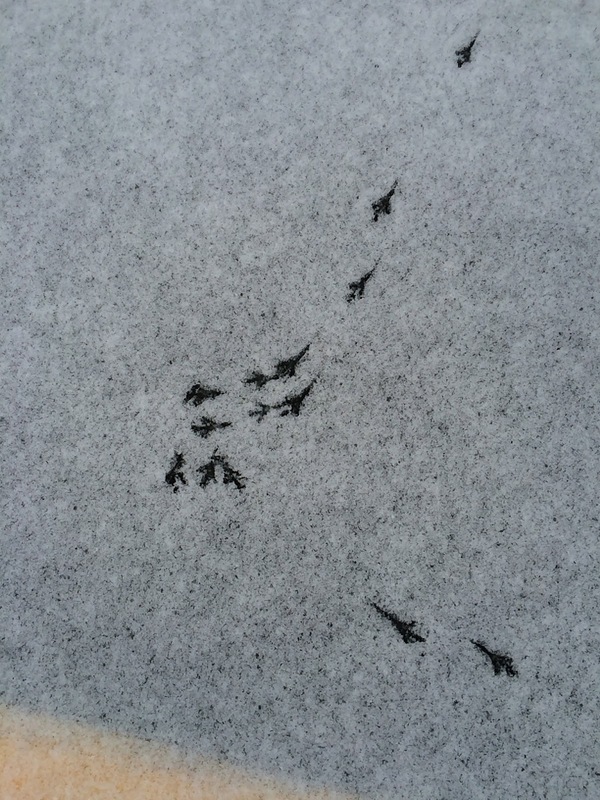 Not sure about the small bird tracks but the larger ones definitely look like raven. 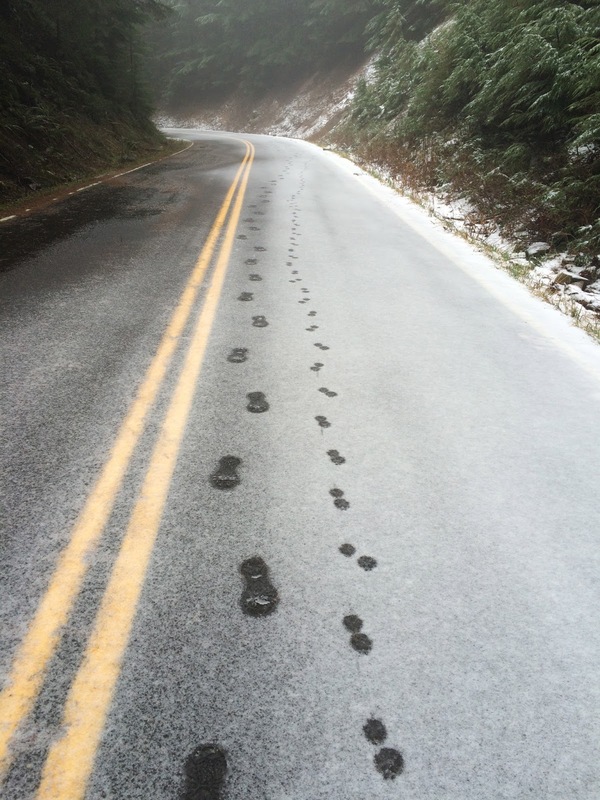 Tracking class this Saturday at Jackson Bottom focuses on gaits and patterns! That creature looks like a freakin' elk caribou yak calf or something. Nice detective work with the tracks. That Towhee does not appear to be dead, but only in a severe state of shock, like he got a really, really good deal on refinancing his mortgage or something. Snow Slug for the win. I love the series of track photos. Each has a story to tell, but the stories differ with each viewer. Thanks, Bill, I wish I had found more tracks to share!